The Adidas Brazuca ball is the latest ball in the 2014 world cup, which will be facing some of the world’s best strikers and overcoming the gap left by the Jabulani ball used in the 2010 world cup. The name Brazuca was chosen through a World cup fan poll and it means “A way of life” in the native Brazilian language. Some of the key improvements and features of the ball are: – six polyurethane panels to keep the ball in same shape and weight in all conditions – A little rough on the surface to avoid unnecessary swerves, dips and to provide better touch and accuracy. -Latex bladder to provide the bounce and rebound as desired. – A little heavier, to provide faster speed. 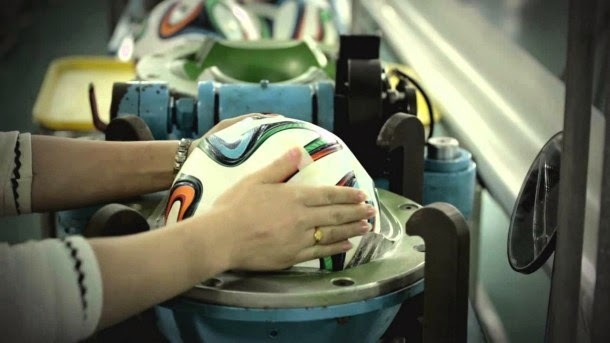 The ball was supposed to be manufactured in China, but as the Chinese factory couldn’t fulfill the supply demand, a factory in Pakistan was given the task. Sialkot; a city in Pakistan quite famous for the sports goods manufactured there was at the task. The percentage of female workers is 90% in the factory, as according to owners, they can take care of the minor details that the male gender misses out on. In the first step, panels are attached together and placed on each ball, which is then heated and compressed in a spherical clamp to give it the perfect round shape. A thermo-molding machine is used to give the balls the desired round shape when inflated. The finishing touches are given to each ball by hand, the Pakistani women being extremely skilled at this sewing job, do a wonderful work. The balls are then tested in a machine that shoots the balls at a metal plate at a speed as high as 30 mph. Each ball must survive 3500 collisions to be approved. Another machine is used to transmit data to a computer which then cross-checks the ball to be perfectly round using a 3D plotter.